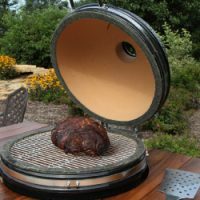 Saffire Kamado Grill – 3 Cookers in One! 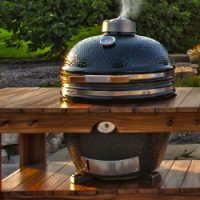 Your Saffire Kamado Grill is truly 3 cookers in one! 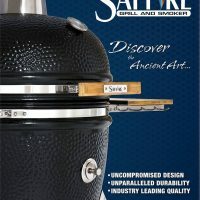 For searing, the Saffire Grill is like a ceramic kiln. Use this kamado cooker to grill steaks as high 700 degrees (click here and read how). Take advantage of the Saffire’s precision temperature control to dial heat down and finish the meat after searing. If you are grilling for a large number of people, add the secondary cooking grid. This increases your cooking area by placing the seared steaks on the secondary grid and putting fresh steaks on the primary grid to start searing right away! There’s nothing quite like kamado cooking on the Saffire Grill. Kamado grills are versatile. They can sear as high as 700 degrees and you can use your kamado smoker to smoke BBQ as low as 200. The Saffire is unique because it has thicker ceramic walls and it has an efficiency plate. Both of these features mean that your Saffire retains heat better than the competition. The Saffire is special because it has the patented, Smokin’ Chip Feeder (click here to learn more about the Smokin’ Chip Feeder). You can add wood smoke with the Smokin’ Chip Feeder to your food at any time during the cook without lifting the lid. This means juicier, better tasting BBQ each and every time. Combine efficiency with Saffire’s All Natural, North American Hardwood Lump Charcoal and you can enjoy mouth watering BBQ, right in your own backyard! The Saffire offers quality and versatility with a Lifetime Warranty! Use it as a brick oven, and bake your favorite recipes, from cookies to pie, cake to pizza (click here and try a pizza dough from scratch). Slow roast your favorite cuts of meat, from pork tenderloin (click here to try Saffire’s stuffed pork roast recipe) to Thanksgiving Turkey. All you need to savor delicious morsels from your Saffire Grill is the Saffire Heat Deflector. It is the Heat Deflector that provides you with precision temperature control. It’s as easy as 1, 2, 3. Set your Primary Cooking Grid and you’re ready to bake! As a result, you will enjoy wood fired flavor from your very own brick oven. Check out the Saffire Facebook page, and you will see just how many cookies and pizzas are baked each and every day. Join the community today to exchange ideas, recipes, and tips.